I will be the first to admit that, as anything other than a genre and body of photographic practice, and perhaps as a particularly mobile and public art-form, the world of fashion is a dark continent to me. It is then, perhaps, simple naïveté that leads me to the broad and less-than-complementary opinion that fashion is a shallow art, and that the industry that shares its name concerns itself with the skin of an image, stuffed with an awful lot of hype. This – and the prospect of shooting fashion images as part of a project on “lifestyle” – lead me to meditate the possibility of utilising a projector to cast that “skin of an image”, and to convincingly conjure the illusion of clothing, onto some suitable mannequin or model. I concluded that it ought to be plausible both as a photographic technique and as a reflexive critique on fashion and fashion photography. Now quite excited at the prospect of playing with a novel technique, I fired up Firefox, and set about researching projection as a studio light source. 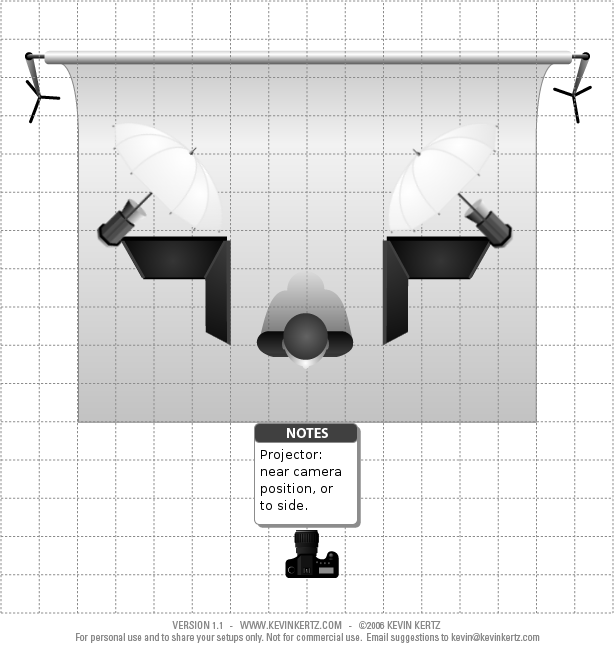 Lighting setup with projector and illuminated, white background. Fashion got there first. In fact, the technique I had independently “discovered” can be traced back to John French‘s fashion work with projected patterns – in the early 1960s. More recently, Eva Mueller and Sølve Sundsbø, among others, have made use of digital display projectors to produce a variety of effects. In 1995, Droga5 pushed the technique, using a battery of upto ten projectors as part of a campaign promoting “light injected” Puma L.I.F.T footwear. And I thought I was so very clever and original.